Fresh, homemade salsa fixings year round! 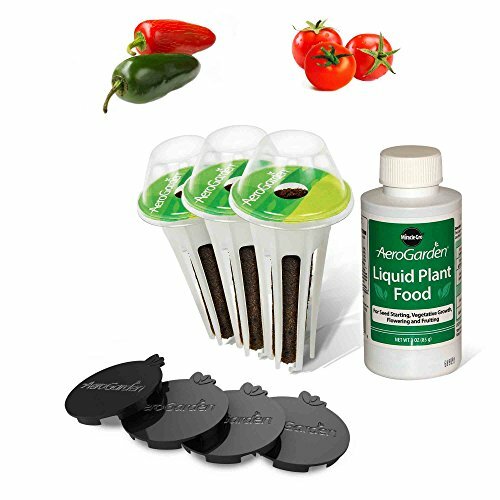 The Salsa Garden Seed Pod Kit comes with everything you’ll need to grow fresh tomatoes and peppers in your AeroGarden and we’ve carefully selected varieties proven to produce. Vegetable plants require more growing space and best results are achieved when no more than three Seed Pods are planted in a 6/7 Pod garden; this Kit contains three (3) Seed Pods and four (4) Plant Spacers so your tomato and pepper plants have ample room to grow and thrive without overcrowding. We’ve paired our Red Heirloom Cherry Tomatoes with our spicy Jalapeno Pepper for an attractive, productive, and long-lasting garden. 100-Percent Germination Guarantee - if a Seed Pod doesn't germinate, we'll replace it for free, No herbicides. No pesticides. Suitable for all AeroGardens. Please note that product packaging may classify plant spacers as part of product's total seed pod count.